Butterfield Community Bible Church, Butterfield, Minnesota. Source: Fellowship of Evangelical Bible Churches website. 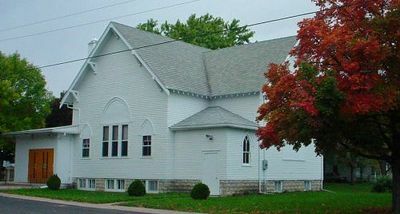 The Butterfield Community Bible Church (formerly Mennonite Church of Butterfield) is a member of the Fellowship of Evangelical Bible Churches. The congregation, formerly General Conference Mennonite, is located in the village of Butterfield, Watonwan County, Minnesota. It had its origin in the Menno Simons Mennonite Church, which united with the Salem Mennonite Church in 1915, withdrew in 1921, reorganized and built a church in 1922, known as the Mennonite Church of Butterfield. After 1999 the congregation withdrew from the General Conference Mennonite Church and joined the Fellowship of Evangelical Bible Churches. In 1953 its membership was 96; in 1999 it was 48. The pastor in 2009 was Jim Sprague. Friesen, J. John and Sam Steiner. "Butterfield Community Bible Church (Butterfield, Minnesota, USA)." Global Anabaptist Mennonite Encyclopedia Online. 2009. Web. 21 Apr 2019. http://gameo.org/index.php?title=Butterfield_Community_Bible_Church_(Butterfield,_Minnesota,_USA)&oldid=140611. Friesen, J. John and Sam Steiner. (2009). Butterfield Community Bible Church (Butterfield, Minnesota, USA). Global Anabaptist Mennonite Encyclopedia Online. Retrieved 21 April 2019, from http://gameo.org/index.php?title=Butterfield_Community_Bible_Church_(Butterfield,_Minnesota,_USA)&oldid=140611.